How to BBQ chicken? Well it's not too difficult really but I appreciate that the it is good to have base to work from. From this base you can alter and edit your own recipe to you tastes. Thats how all of the great recipes in the world occured, expreimenting and altering ingredients, cooking times etc etc. So here it is. A simple guide on how to BBQ Chicken. I recommend legs and wings to start with as they are easior to cook and harder to burn. 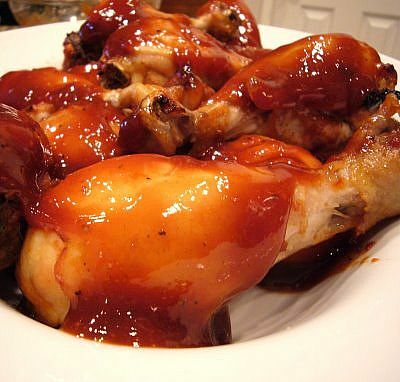 You'll need some kind of BBQ sauce, you can buy these from a shop, use your own or find one from one of the BBQ chicken recipes on this site, like this one for example. OKay we need to start by washing the chicken in cold water and then put on some paper towel to drain. Pour you BBQ sauce into a bowl and then put each piec of chicken in ensuring that they get a good coating of the sauce. Now it is a good idea when BBQ-ing to cook your chicken in the microwave for a bit first, just to ensure that the chicken is cooked fro the inside out. 10 Minutes on medium heat should do it. Thats why microwaves are so useful. They actually cook from the inside. And thats why you should never out your cat in the microwave! Okay, now for the fun part. get the BBQ nice and hot but bare in mind that you don't want any flame, unless it's gas of course. Now make sure the BBQ rack is about 5 inches or more away from the coals and cook the chicken on oneside for about 20 minutes and then turn it over and do another 15 - 20 minutes on the otherside.. Make sure you brush with the BBQ sauce every now and again.